If you followed my recommendation and started the day with a walk along the ocean you easily get onto HWY 1 from New Brighton State Beach by turning right into Park Avenue. The highway ramp towards Watsonville is on your right. Getting to HWY 1 from Santa Cruz - Take Ocean Street to the north and make a right at its end towards HWY 1/ Watsonville. Getting to HWY 1 from Capitola - If you stayed in Capitola overnight drive up Capitola Ave and turn left into Bay Avenue, which leads you to HWY 1 South towards Watsonville. 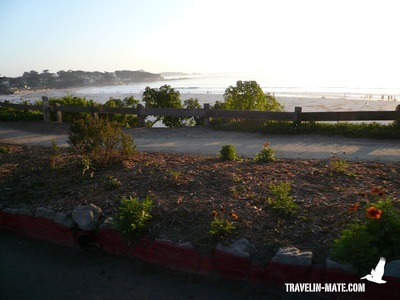 After leaving Santa Cruz and Capitola behind, you are driving towards Watsonville on HWY 1. Watsonville is a provincial town known for market gardening. Further south an ugly power plant takes over your attention. This might lead to the fact that you pass Moss Landing without notice. The sleepy village at HWY 1 has a small but cute harbor and is known for the Elkhorn Slough, the home for many otters, herons, seals and pelicans. If you consider a stop, you will find a nice village center and harbor along Moss Landing and Sandholft Road and a beautiful beach at the end of Potero Road. If you are hungry or need a coffee go to Sea Harvest, a tiny fish market on Sandholdt Road or stop at Moss Landing Café at the village’s limit. Behind Moss Landing follows Castroville, the US artichokes capital. Castroville covers about 75% of the national artichoke demand. Leaving Castroville you are passing Salinas, Marina and Sand City. Since HWY 1 runs parallel to the ocean in this area you can expect nice views over high sand dunes and the ocean. Behind the Best Western in Sand City you can already see Monterey in the far. The best way getting there is by taking the exit Del Monte Blvd. Follow Del Monte Bvld, which passes the Marine University until you approach Monterey’s Municipal Wharf (to your right) and old town (to your left). At the end of Del Monte Ave, you are entering a tunnel that takes you to famous Cannery Row if you are staying on the right. 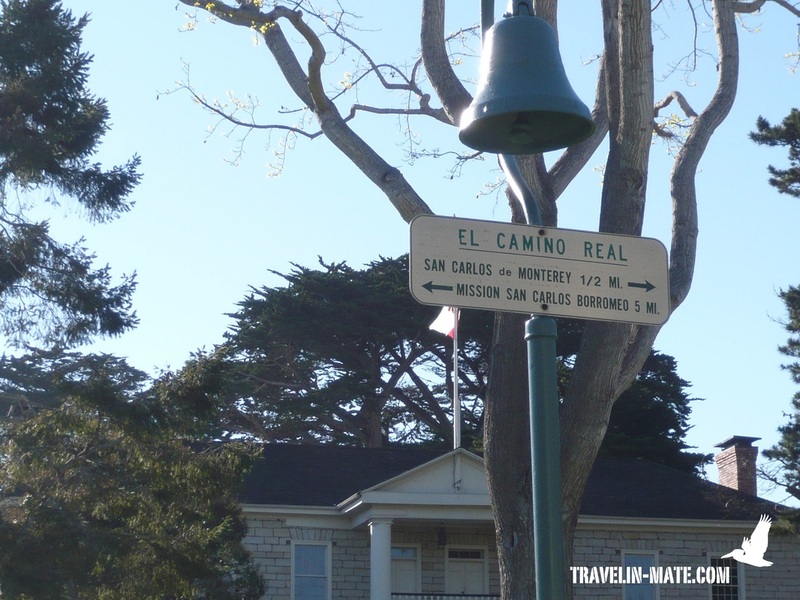 Monterey has an historic Hispanic city center that was developed between 1777 and 1849 when the Mexicans and Spanish ruled Monterey. At that time, the city was the capital of California. One of the oldest buildings preserved from this time is the Royal Presidio Chapel. Today the chapel is the oldest church in continious use in California and located at 550 Church Street. The city offers a self guided historical tour called “Monterey Path of History”. This tour takes at least 2 hours. For a detailed old town tour map go to the tourist information at the beginning of Munras Avenue or download the map under the following link: http://www.mtycounty.com/pgs-path/apath.html. 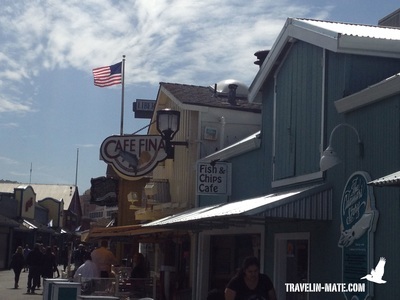 Monterey’s Municipal Wharf is very touristy and holds typical wharf restaurants and souvenir shops but also many boat companies that offer whale watching tours. It only makes sense to book these tours from November to March since this is the time when whales are passing through Monterey Bay. Make sure you bring warm clothes even when it’s a warm day in Monterey because the differences in temperature from shore and ocean are extreme. If you want to see Cannery Row follow the trail along the shore that starts at the Municipal Wharf or drive through the tunnel at Lighthouse Ave. Behind the tunnel follow the signs to Cannery Row to your right. To catch the whole strip, make an immediate right after the tunnel into Foam Street. Then make a left into Reeside Street and another left to the beginning of Cannery Row. In 1958 the previous Ocean View Avenue was renamed after John Steinbeck’s bestseller “Cannery Row”. Nowadays fancy hotels and souvenir shops replaced the former canneries. The row became a touristy hot spot and restaurants, bar, pubs and shops are lining up attracting the crowds during night and day. At the end of Cannery Row is the famous Monterey Bay Aquarium: http://www.montereybayaquarium.org/. It’s definitely worth a visit because of their different exhibitions. However, if you are in a hurry and are facing a long line skip the visit and walk down Pacific Grove’s coastline where you have sea lions, seals, otters, pelicans, herons, and other sea birds. 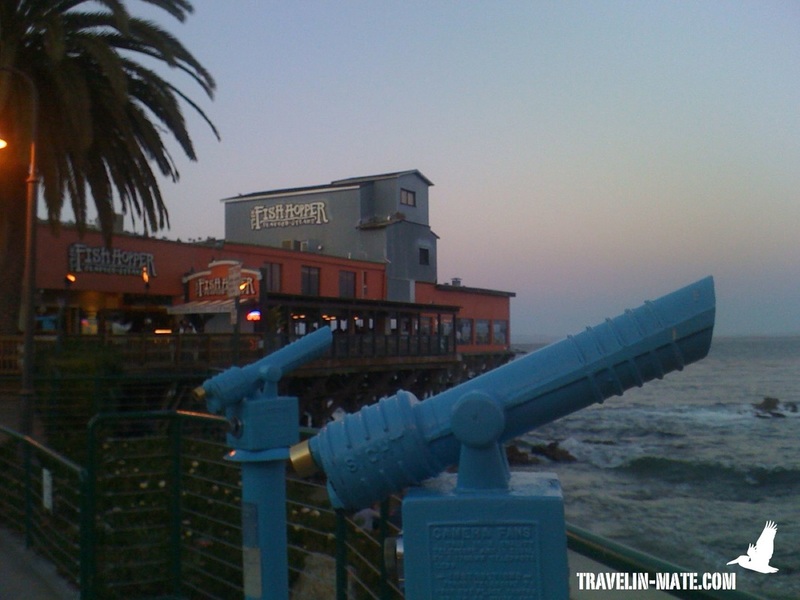 As I mentioned before, Cannery Row offers a big choice of restaurants, pubs and bars where you can spend a nice evening and lunch break (please see the restaurant section for more details). One of my favorites for a break is the Ghiradelli Café. Although their main focus lies on chocolates they offer great ice cream, coffee, and drinks. Try to get a seat on their balcony, which faces the ocean. 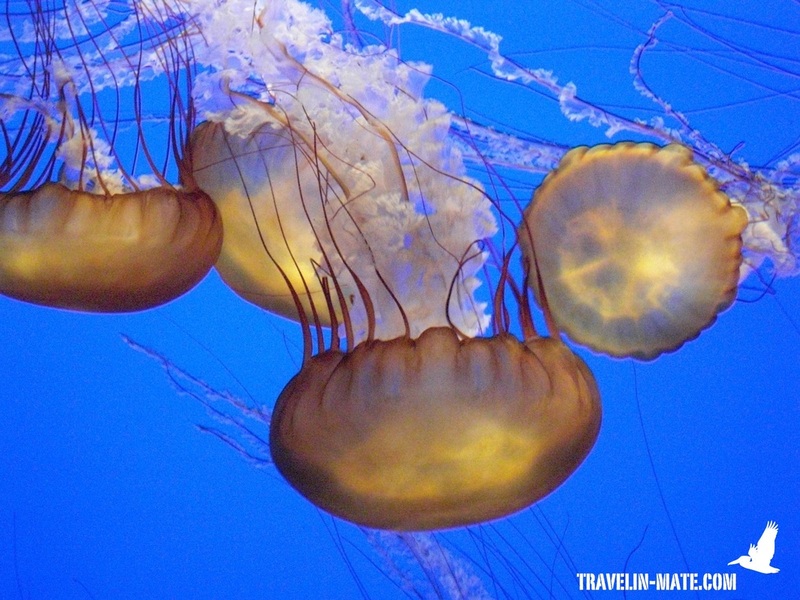 Monterey is adjoined by Pacific Grove, a coastal town with beautiful Victorian houses and beach villas, which are popular with artists. A 4-mile coastal trail (roundtrip) along natural flowerbeds, beaches, rock formations, parks and a busy sea life makes the town so special. This sounds to good to be true? Look and see! At the trail’s end you will come along Pacifc Grove Golf Links that are surrounding the Point Pinos Lighthouse. It’s the oldest continuiously operating lighthouse at the West Coast and located within the well-maintained golf courses dunes. BWT - the golf course is the low cost alternative to the high priced links along 17-Mile-Drive, which starts at the end of the Sunset Drive behind the Beachcomber Motel. If you are heading for the coastal trail aka Ocean View Boulevard make a right behind Monterey Bay Aquarium into Dewey or First Street and follow the streets to the end and the ocean. On both sides of Ocean View Boulevard you will find free parking spots. If you are not in the mood walking the whole distance, park your car at least at Lover’s Point and walk the short distance to Perkins Cove and back. This section is really beautiful, especially during May and June when the coastline is covered with thousands of tiny pink blossoms. If you are lucky the small shack at Lover’s Point is open and you can grab some refreshmens or hotdogs. Below the shack is a small kayak and bike rental in case you would like to discover the bay from the sea. Behind Point Pinos Lighthouse, Ocean Boulevard turns into Sunset Drive and continues along a rough coastline and dunes. Behind the Beachcomber Inn at the next intersection is the entrance of 17-Mile-Drive to your right. You have to pay an entrance fee but it’s worth every penny! In return you will not only get the admission to drive along an amazing coastline, but also a map listing all sights along 17-Mile Drive. The lower route is the more beautiful leading first along the shore and later through pine forests to Pebble Beach. The upper route is less spectacular and I recommend skipping it. 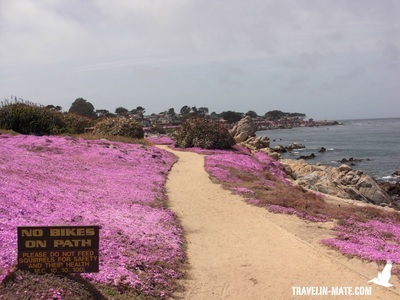 Before cars were even invented, the 17-Mile Drive, formerly known as Del Monte Forest, was crowded with carriages that were transporting guests of Del Monte Hotel to popular picnic areas along the shore. In 1917, Pebble Beach Golf Links were built on the peninsula and the 17-Mile Drive was used as access route. Nowadays the golf course is one of the most famous in the world. The lower route is guiding you along several stops; amongst others stop no. 10-11, the Bird Rock and Seal Rock. 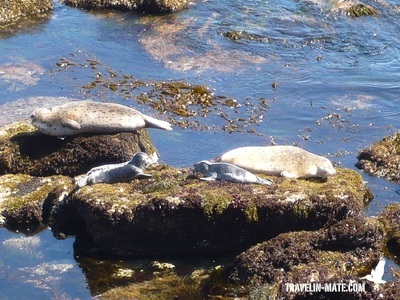 As the names imply, you will see several birds and seals basking themselves in the sun. Offering you a closer look, there are some telescopes erected at the shore. Usually you will also see hundreds of gophers or similar gnawers at the site. If you are around 17-Mile Drive before April 1st stop no. 14 “Cypress Lookout” is still open. At this spot otters and seals are sharing the beach to raise their offspring and to teach them how to swim and catch dinner in the shallow water. As you can imagine it’s really fun watching them. After April 1st the lookout will be closed until June to keep curious tourists away and give the sealife some privacy. Pebble Beach itself is not only an attraction for golfers. The whole area is worth a stop since the sophisticated clubhouse offers awesome views over the coastline, e.g. towards Carmel Beach. If you walk to the right around the clubhouse you can enter the area behind the 18th green and get closer to the cliff by walking down the small aisle. Also a great alternative if you feel not appropriately dressed for the fancy clubhouse. 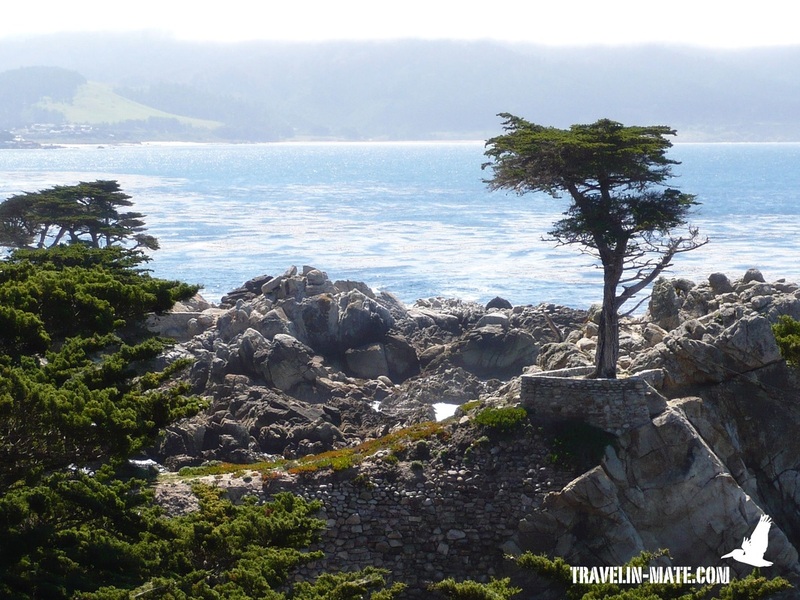 Behind Pebble Beach is the 17-Mile Drive exit/entrance of Carmel, a beautiful coastal village attracting many well-off people. Of course you can take the upper 17-Mile-Drive as well, but you solely drive through the forest, except for stop no. 1 “Shepherd’s Knoll”, which offers a panoramic view over the bay – assumed there is no coastal fog. 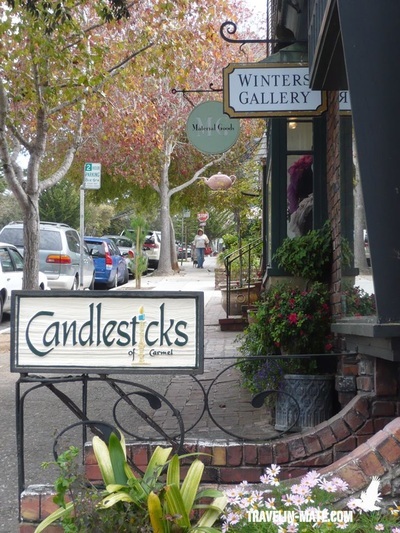 As mentioned before, the village of Carmel-by-the-sea is attracting wealthy people and has an upscale appearance. Along Ocean Ave plenty of shops are offering luxury goods and unnecessary things you might buy if you have it all. 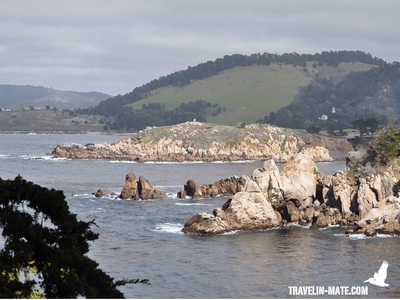 Nevertheless, I recommend a visit because Carmel offers a mix of maritime and Hispanic atmosphere, small alleys and squares and a beautiful coastline and beach. Plus there are enough down-to-earth people who enjoy the quaint atmosphere as you do. Enough reasons for a stop during your HWY 1 tour. Carmel is the last bigger village before you hit the Big Sur and your last chance to stock up gas and drinks and snacks for reasonable prices, e.g. at The Barnyard Shopping Center at HWY 1. BTW - Clint Eastwood was the former mayor of Carmel and also has some shares in the Carmel Mission Ranch, a hotel that was saved by him from being taken down. 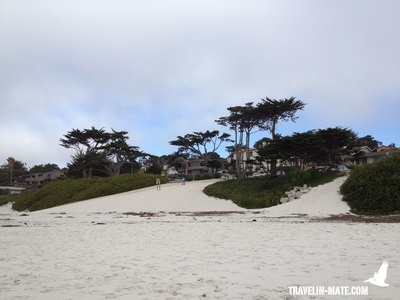 You easily can spend half a day in Carmel visiting its beautiful Mission, strolling along Ocean Avenue, its side alleys and their squares, grabbing a coffee or tea and walk down to the beach to enjoy the sunset. You even can extend your stay and hike through Point Lobos (http://www.pointlobos.org/), a state park located at the ocean offering several trails to discover its nature. Coming back to the amazing beach in Carmel: before you leave the town, cruise along the beach for scenic views over the shore. You only have to drive down Ocean Ave and turn into Scenic Road, a one-way street. This street guides you to the beach’s southern part and Carmelo Street. If you follow Carmelo Street to the north you will get to 15th Ave and if you turn right you will drive towards Clint Eastwood’s Mission Ranch and the Carmel Mission. The official name of Carmel’s mission is Mission San Carlos Borromeo de Carmelo. It was built in 1770 and is still in use for services. Moreover it holds a museum, similar to other missions, which shows the life of missionaries in the 18th century. 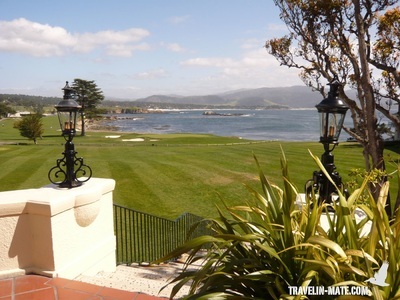 Looking for accommodations in Carmel you are spoilt with choice of many beautiful inns such as the Normandy Inn. But you have to be aware that they are quite pricey and you barely get rates under $150 per night. The best deal so far is the Comfort Inn at the beginning of Ocean Ave. Same story when it comes to restaurants, but similar to the accommodations there are exceptions as well. For example, a good place to start the evening is the Sunset Lounge at the Hyatt Highland Inn. The Lounge is another spot to enjoy the sunset if not at the beach. A good recommendation for dinner is A.W. Shucks at Ocean Avenue, a small bar with real good food and friendly service. More recommendations are listed in the hotels and restaurant section for HWY 1.